Zhou B Art Center is delighted to welcome the National Veterans Art Museum’s “Vietnam Transformed: The Art of Richard J. Olsen as Symbolic Reality,” an exhibition of work from throughout the career of longtime NVAM-artist and veteran Richard J. Olsen, in collaboration with curators Andrew and Hathia Hayes, and with curatorial assistance of Anthony F. Janssen. This follows the original exhibition of the same title at the NVAM that closed in August, and will open on Nov 10th, Veteran’s Day (observed), on the second floor of Zhou B Art Center, 1029 W. 35th St., Chicago IL, on view till Jan 11th, 2018. In his work, Richard Olsen conveys underlying themes such as the tension between good and evil, the experience of war, and his immediate environment–his studio–by embedding images that are symbolic and allegorical without relying on representation. Olsen began using symbolism early in his career, but this approach for conveying meaning came to the forefront during his mature period during which he creating paintings based on his wartime experiences as a transport helicopter pilot in the Vietnam War. The exhibition will showcase work spanning the artist’s career, but will highlight his “Wall” series, for which he is probably best-known. During his graduate studies at the University of Wisconsin, Olsen’s artistic approach was to represent the likeness of people, places and events from his life. 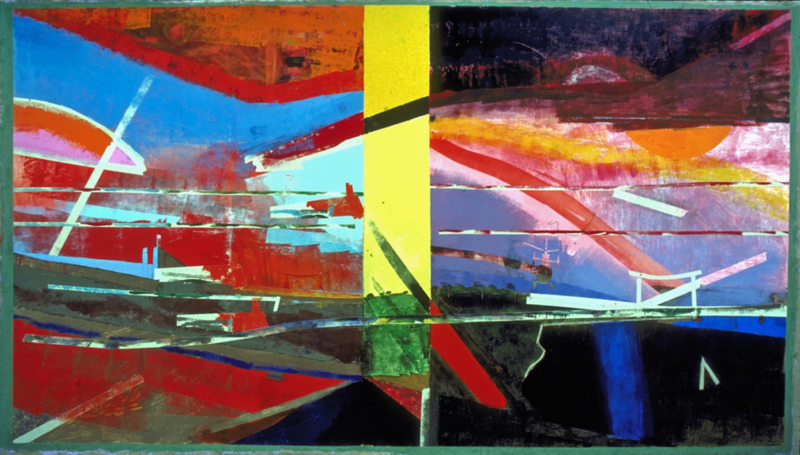 After accepting a faculty position at the University of Georgia in 1969, he felt pressure to move toward pure abstraction and leave behind his representations of the Vietnam War. He spent time experimenting with a variety of painting techniques, and once again began adding abstracted images pulled from his experience in Vietnam. Despite mastering these methods of painting, Olsen struggled to find his voice and legitimacy and continued to ask himself “What do I paint?” In 1977, he took the advice of an artist’s cliché, “If you don’t know what to paint, paint your studio wall,” and covered the walls of his studio with canvas and let them depict different aspects of his artistic life. These early canvases were the beginning of his “Wall” series. By the mid-1980s, Olsen’s approach to both painting and subject matter became clear. He constructed collages, which he called “Calculations,” on grid paper as blueprints for his larger canvases. He depicted his previous works in these collages, and continued this method, adding images of previous paintings and objects in his studio. Olsen’s “Wall” designs are intended to be allegorical by linking the pictorial artifacts of his Vietnam wartime experiences to systems of meaning – the balance of good/evil, and the legends traditions of culture. Olsen’s war experiences are made real to viewers by the collection of pictorial symbols within each painting and linking the imagery to higher-level meanings.